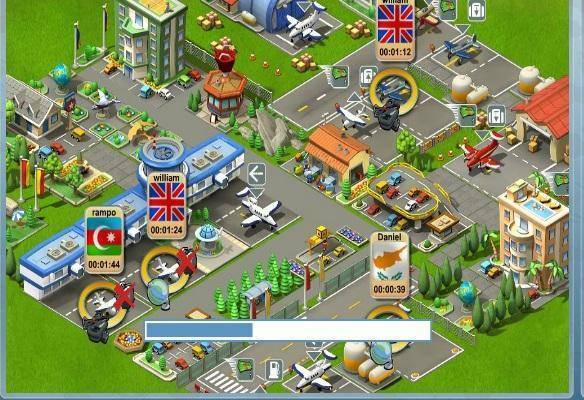 In this free to play browser-based game players are responsible for managing their own airport, interacting with their friends at airports and that of other players from all around the world in a cooperative gameplay experience. Sharing flights with other people, helping manage resources, handling cargo distribution as well as putting on spectacular airshows and more is the aim of the game. The key to the game is working together in this family friendly strategy game which utilises exceptional quality cartoon styled graphics. Starting out life with a small, but useful airstrip and slowly over time adding to its to evolve it into a bustling international hub with flights coming and going from across the globe that puts you in contact with friends near and far. Working with your fellow airport managers you will focus on advancing your airport to enable new features, buildings (both airport and passenger buildings) and even aeroplanes. Continuous player income can be used to purchase unique looking aircraft and further improving your airports all general layout and design, and slowly unlocking new and unusual aeroplanes. Make an attractive airport using decorations and you will attract passengers to your airport willing to use your flights, alternatively it by visiting a body with your plane you are all so able to pick up passengers at their airport (your friends won’t lose passengers in doing so, but this kind of interaction is rewarded). Each of the 15 available aircraft have their own individual features, making them truly specialised four different quests and tasks, which come in the form of story driven objectives as well as daily missions for players to accomplish. Such achievement based missions involve “landing your first plane”, “place your first hangar bay”, “send x number of planes to ” and more, giving you a constant sense of achievement and reward whilst playing. Players are able to track flights through the dynamic map which shows flight connections between you and your friends as they travel across the world giving a real sense of air traffic control management. The game itself has a variety of form seems and seasonal events creating new content and new items for players to collect whilst playing with their friends.